Can You Eat Grains if You Have Wheat Allergies? Do Steel Cut Oats Contain Gluten? Wheat bran is the edible outer layer of the wheat grain, separated from the rest of the grain during sifting. For most individuals, wheat bran provides a good source of dietary fiber that helps maintain digestive health. For those with an allergy or intolerance to wheat, however, wheat bran can trigger mild to severe reactions that affect overall health. As a result, allergic individuals should avoid wheat bran and other wheat products. A wheat allergy occurs when the body's immune system mistakenly identifies a protein found in wheat as a threat, creating antibodies in response. These antibodies trigger a reaction whenever an individual consumes wheat bran or other wheat products. According to the Asthma and Allergy Foundation of America, the proteins that potentially cause allergies include albumin, globulin, gliadin and gluten. Most true allergies to wheat occur during early childhood and fade as children age. Very few adults have wheat allergies. Wheat allergy and wheat intolerance often mimic one another, but as the University of Kentucky College of Agriculture explains, intolerance often occurs as the result of a hereditary disorder of the immune and digestive systems and may not fade with age. The most common example is celiac disease, an intolerance to the gluten protein that causes damage to the small intestine whenever food containing gluten passes through, eventually resulting in poor nutrient absorption. In most cases, an allergic reaction begins several minutes to two hours after consuming wheat bran or other food products containing the offending protein. Common symptoms include irritation of the mouth, hives, watery eyes, nausea, vomiting, diarrhea and nasal congestion. More severe symptoms such as anaphylaxis -- a reaction causing dizziness, rapid heartbeat and severe difficulty breathing -- may also occur and require immediate medical attention. Symptoms of wheat intolerance generally stay within the digestive system. Aside from wheat bran, any product that lists wheat, gluten, albumin, globulin or gliadin could trigger an allergic reaction. Additional wheat products that may seem less obvious include gelatinzed starch, hydrolyzed vegetable protein, vegetable gum, vegetable starch, semolina, durum, bulgur and farina. Most standard flours, including all-purpose flour, cake flour, bread flour and self-rising flour, also come from wheat. Pre-packaged cookies, crackers, pasta, cereals and baking mixes also typically contain wheat. Carefully check the ingredients listed on any product before you buy. Bran can originate from any grain, including rice, corn, oat and barley, but any product listing "bran" without specifying the type generally contains wheat bran. 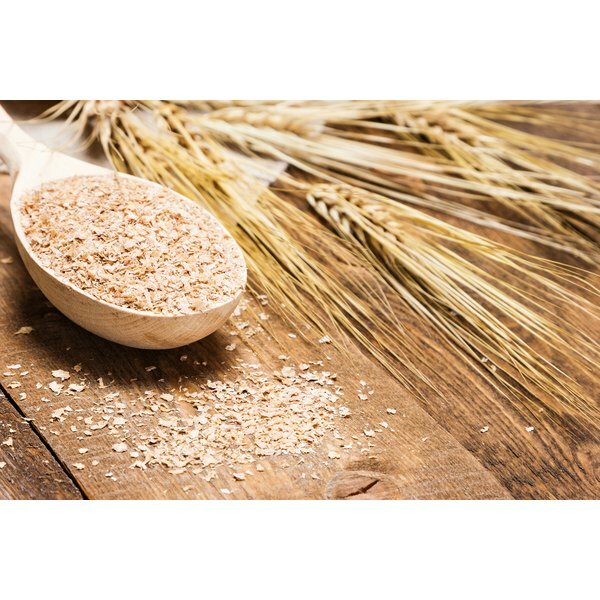 Queensland Health states that, while those with a reaction to wheat may also have reactions to other grains, rice bran and oat bran often prove tolerable. Common wheat substitutions in general include products made with rye flour, potato flour, potato starch, rolled oats, rice flour, cornmeal and corn starch. Caitlynn Lowe has been writing since 2006 and has been a contributing writer for Huntington University's "Mnemosyne" and "Huntingtonian." Her writing has also been in "Ictus" and "Struggle Creek: A Novel Story." Lowe earned her Bachelor of Arts degree in English from Huntington University. Can a Gluten Free Diet Help Sinus Infections? What Is an Amaranth Allergy? Does Wheat Starch Have Gluten? Are Red Spots on the Skin a Gluten Allergy?